In an earlier post, Towards Impeccable Behaviour. 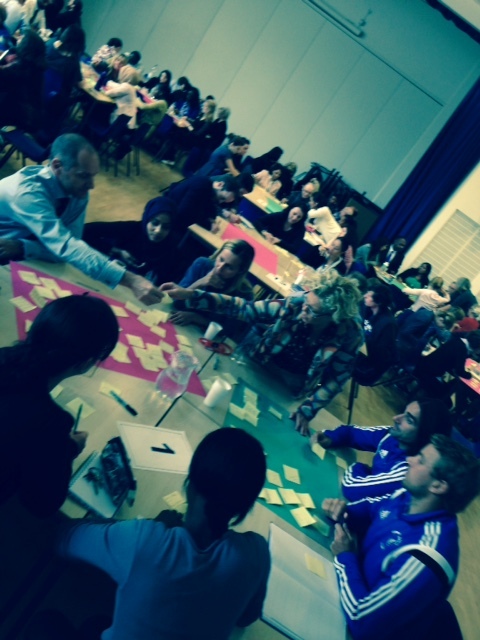 Together, I described the process we would be going through to set up a new behaviour system at Highbury Grove. Behaviour is generally very good in the school but we’re aiming extremely high, with ‘impeccable behaviour’ as our goal. To get to this point, we ran two half-day closures for full staff CPD and consultation. It was the first time every single member of staff had been involved in anything like this. Tables were pre-set to ensure a mix of teachers and people with other roles in the school. The first half of the first session allowed people to off-load all of of their frustrations about behaviour. This was a moment of catharsis for many people. The second half was harder; people were asked to turn the issues into rules that could be used to generate better behaviour. The first staff session. Post-its and sugar paper – rules for everything. In-between the two whole-staff sessions we held a meeting of our newly formed Behaviour Working Party – volunteers with an interest in this area. We thrashed out a consensus of the main rules to underpin the system based on the ideas generated from the staff. In the second whole-staff session, I outlined the agreed rules and how the consequences system would work. 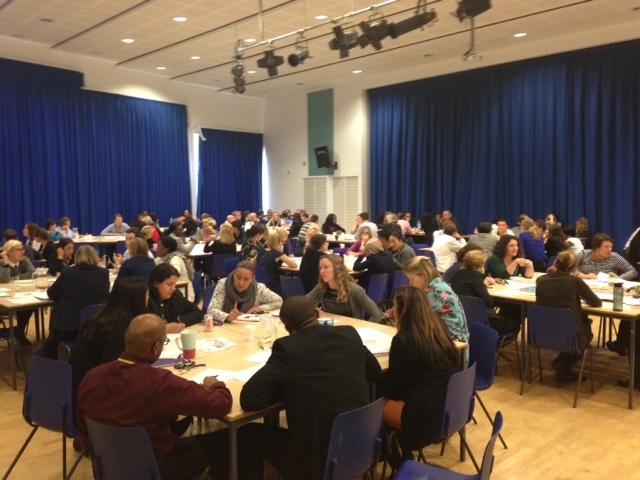 Staff were then asked to consider every conceivable scenario in their groups to work out how the system would work in practice. This generated lots of questions which allowed us to clarify how the system should function in the detail. The second session. Ok – so how does it work in practice? With all of the details discussed, I worked closely with the Behaviour Team to look at the function of the Behaviour Support Centre. We decided that we needed a significant buffer zone between the mainstream school and permanent exclusion so that we can remove all the students who disrupt lessons and can’t cope within our system (yet). We’ve devised a rolling programme where they will be taught in a unit with a separate entrance with an explicit focus on teaching them how to behave within the rules. They could be there for a week or up to six weeks depending on their readiness to reintegrate. Meanwhile, we’re going to be pushing for zero disruption /zero defiance everywhere else, in school and in the community around it. I don’t want any teacher to feel that any of their classes is difficult to teach because of behaviour; that’s not acceptable. This week I ran assemblies for each year group setting out the key features of the system. I’ve been keen to stress that our goal is for the school to continue to be a happy, friendly school full of humour and love; the rules and consequences are there to help us achieve that whilst also delivering impeccable behaviour. We also stressed that although the standards are very high, every student is capable of meeting them if they choose to. Everything that constitutes breaking a rule – being late, not having a pen, being rude, arguing with a teacher or refusing to work hard in lessons – is the result of a choice a student has made that leads to a consequence; effectively they have chosen the consequence. I’ve decided that the student consultation aspect of all of this needs to follow the introduction of the system. This is because, in truth, the system itself is non-negotiable and the details needed to be driven by the experience of staff. It felt rather abstract explaining it to the students in some early conversations. They didn’t really understand quite how high the bar was going to be set. However, once we are up and running, we will seek student input to help us revise and refine the rules; there will be pockets of relative strength and weakness in the way the system works across the school and students’ perspectives will be key in identifying the details of that picture. We are ready for a few weeks where the numbers receiving sanctions will be very high as we enforce the new boundaries but I’m confident that we’ll make a dramatic change to students’ perceptions of what constitutes normal acceptable behaviour within a few months. Already, we’ve transformed the uniform. We’re down to a small handful of students who find it hard to wear their tie correctly – and they are usually students with larger necks and shirts that don’t fit! It was simply a matter of setting our expectations high and insisting. BfL is a way to translate the top-button symbolism into every other aspect of behaviour and we are all very excited about the difference it will make from October 13th. With this in place, our push on standards and our work on teaching and learning have a much greater chance of succeeding. In a follow-up, I ‘d love to see how many students transfer out of your school – both the voluntary withdrawals and the exclusions. As an American educator, this experiment reminds me of our “no excuses” charters, which have high rates of attrition, especially for special needs students. We have had to face the realization that students don’t just go away when we exclude them and our communities have had to face the high costs that result from their failures. I’ll be watching that closely. We’ve extensive staffing to support students who will find this challenging. But, the bottom line is that no-one has the right to disrupt the learning of others, even if they end up marginalised. The cost of supporting those students needs to be weighed against the cost to the learning of other students along the way. I’m under no illusions; any student I have to exclude will be a personal tragedy for them and I’ll do all I can to keep them. But behaviour management shouldn’t be so hard that people leave the profession. Another first-rate post, Tom, thank you. In your BfL guide it mentions “respond promptly to the signal for attention”. Have you adopted a school-wide policy on asking for silence and attention. Would be interested to know as we are having that debate at the moment. For what it’s worth, I think it would suit my school at this point in time. Hi Steve. Yes, we’ve decided that every teacher needs a signal (that they need to teach to their class) and that students must respond, giving attention in silence. That will enable a raft of activities to take place without behaviour inhibiting the flow. In theory! Thanks, Tom, do they all use the same signal? Do you mind me asking which one you went for? Best wishes, Steve. Our school run a similar system. It has brought compliance in lessons and now our challenge is turning this into behaviour for learning. I will be interested to see how your policy progresses. That’s our challenge too. We want to eliminate all the negative disruptive behaviour but not suppress engaged, enthusiastic learning. Let’s see how it goes! Will you have a praise system to mirror C1-C4? I was thinking P1-P4 with tangible rewards linked to receiving praise during lessons, or do you feel this would over complicate the very clear system you have described? What are your thoughts / plans for positive praise? P1-P4 mirroring the C1-C4 appeals to me with tangible rewards linked, or do you think this will over-complicate the system you have put in place? I’m not in favour of rewards for behaviour. It’s not a question of complication but of motivation; I want students to behave because they learn that good behaviour is intrinsically rewarding, not because they get something given to them in return (beyond a better education.). Our rewards are for other things linked to achievement and participation.